Sloping concrete roofs are possible. With modern foam decking systems, even complex roof designs can be created. They can support an enormous amount of weight, so concrete roofs can be converted into decks, rooftop gardens, or even additional parking space. 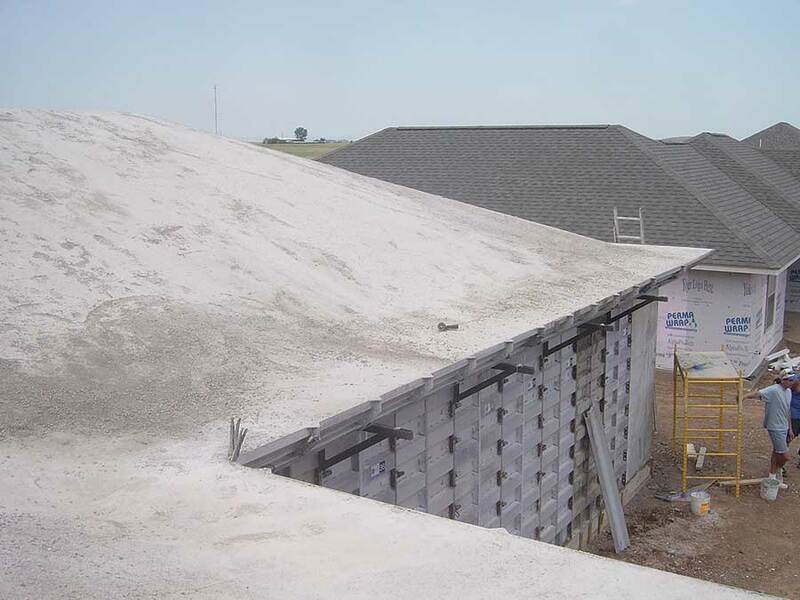 And coupled with a foam forming system, such as Lite-Deck, concrete can create a high-performance roofing system that “completes the energy envelope.” Just like ICF walls, the combination of foam and concrete in the roof protects interior spaces from outside temperature fluctuations. 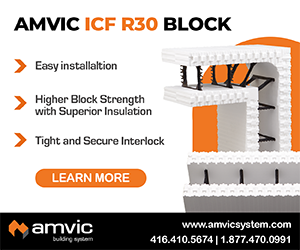 Near airports, these “ICF roofs” have proven to dramatically reduce sound infiltration. But just because a home has a concrete roof doesn’t mean that it has to be flat. 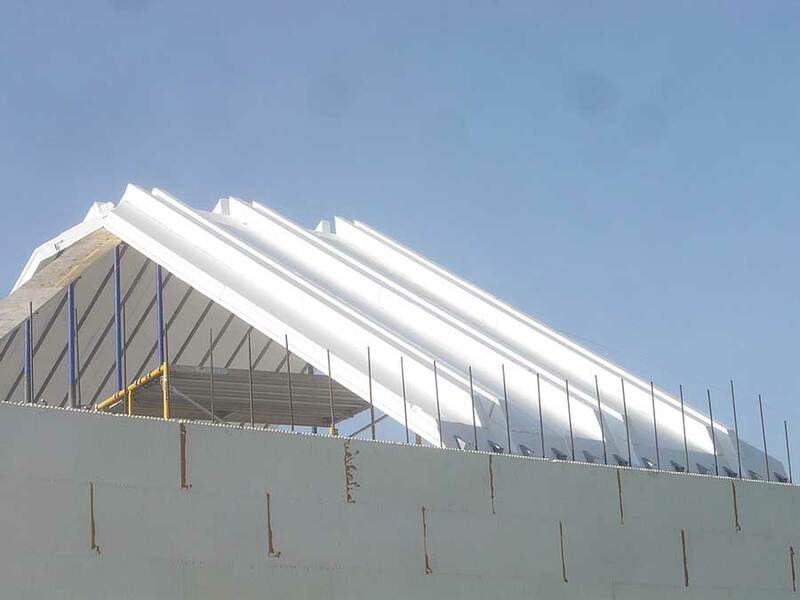 Thanks to innovative forming systems and improved design software, sloped concrete roofs are easier now than ever before. 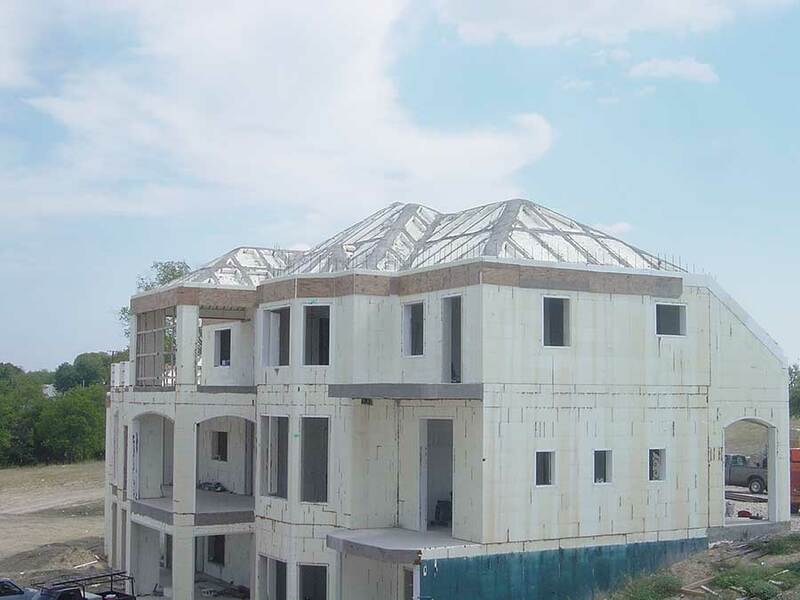 A few builders, like Mike and Dustin King of Ateg Engineering, are taking on incredibly complex roof designs, with multiple hips, valleys, and ridgelines, and constructing them out of concrete. 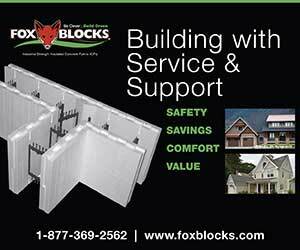 Foam decking creates a series of beam pockets, which are filled with reinforced concrete. Pockets running parallel to the ridgeline are usually cut into the foam on site. Some designers recommend a monolithic slab poured over the top of the beams. Others design the final roof finish to be applied over the foam. 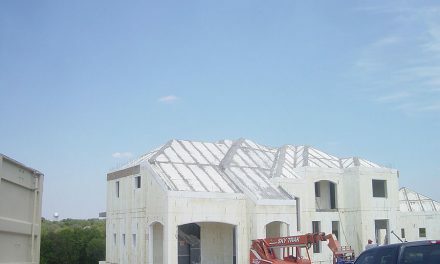 The Kings have designed and built a number of complex, sloping concrete roofs in North Texas. One was installed on the 15,000 sq. ft. Hoffman residence just east of Dallas in Forney, Texas. 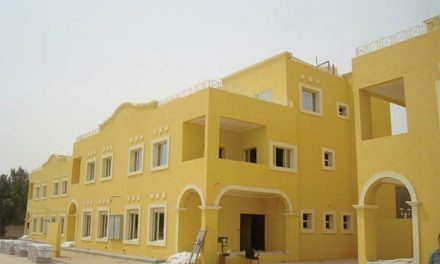 It has 15 rooms on three levels, and the roof is unbelievably multi-faceted. King even did the bay window roof. He uses adjustable Pro-Shore bracing, with beams running 6 feet on center and posts about every 4 feet. King uses a regular low-slump concrete for most roofs. “We used a 3-inch-slump mix on that project—it has a 7:12 slope—and it stayed in place no problem. I think the steepest we’ve personally done is a 9:12 pitch, and it worked out just fine. Pat Boeshart, inventor of the Lite-Deck system, points out that placing concrete on a sloped surface is not new. “They’ve been doing it since the 1960s on concrete-lined canals and stormwater drainage channels,” he says. 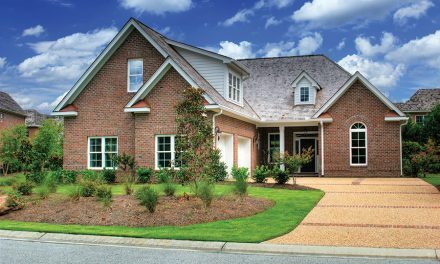 Perhaps the most difficult challenge for sloped roofs is the engineering and design work. On the Hoffman home, King spec’ed a steel I-beam at the ridge line, with the Lite-Deck running perpendicular to the ridge. “We’ve done a lot of steel ridge beams, but we’ve also done a number of concrete beams too,” he says. Channels for concrete beams were cut into the foam at all the hips and valleys. A channel was also cut in the foam halfway between the eaves and the primary ridge line, to tie the other concrete beams together and help support the ridgeline. “There’s no reason why you couldn’t do the slab,” says King. “In this case, it was just the way it was done.” The roof was surfaced with Fossilcrete, which was stamped and colored to resemble shingles. The same product was used on the exterior walls, which were carved to resemble ashlar-cut limestone. Cloyd “Joe” Warnes, a concrete expert and consulting engineer, has more than 40 years of experience with pitched concrete roofs. He built one of the first “all concrete” homes in California in 1966 as part of a study by the U.S. Dept. of Housing and Urban Development (HUD). Warnes points out that if the concrete roof is properly tied into the ICF walls, the entire structure is significantly stronger. All three major brands of foam decking, Lite-Deck, Insuldeck, and Amdeck, have engineering details available on how to make these connections. 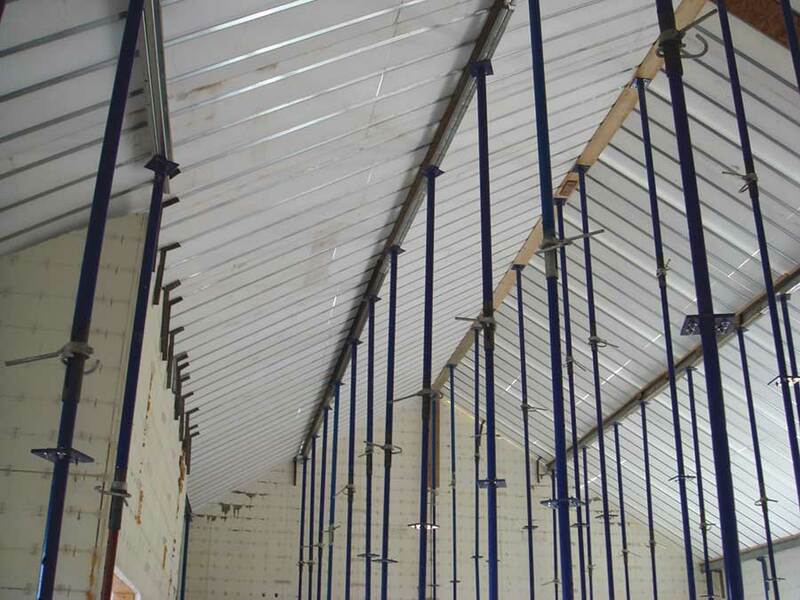 Warnes notes that pitched roofs can be built using a number of other technologies—such as steel joists and plywood—but only foam decking includes the insulation, sound attenuation, and other features most owners will want. At a presentation he gave at the fall 2006 ACI meeting, he explained the general design process. First, design the structural supports at the ridgelines and in the valleys. 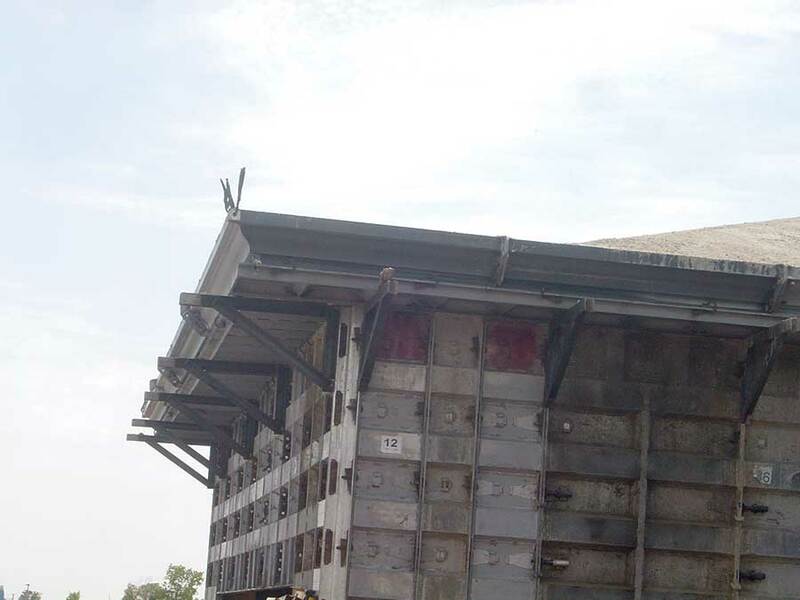 Second, determine how the building eaves will be formed and shored. Next, calculate the planking (or other forming) requirements, shoring and rebar needed. The actual construction process follows those steps quite closely. After the ridgeline beams are installed, contractors form the eaves, shore them, and then place the forming for the rest of the roof. After that is also shored, the rebar is placed and tied into the walls. Any additional beam pockets are cut into the foam at this time. When everything is in place, the concrete is poured, first in the beam pockets, and then as a slab over the entire structure. The Hoffman home is built without eaves, but King says there are a number of different ways it can be done. “We’ve done it a couple of different ways. You can end the concrete at the wall, but run the foam out past the wall as eaves. We’ve also formed the eaves with plywood, shored it real well, and poured it with the rest of the roof. Western Forms has an eave form that we’ve used and had good success.” Another possible method is to frame out the eaves as with traditional construction. 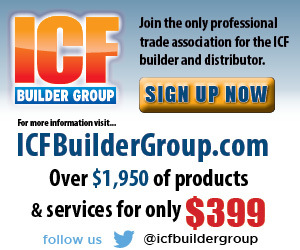 With foam decking, interior finishes are installed just like they would be in ICF walls. Chases and light boxes are cut in with a hot knife. Insuldeck has pre-cut utility chases molded into the foam. 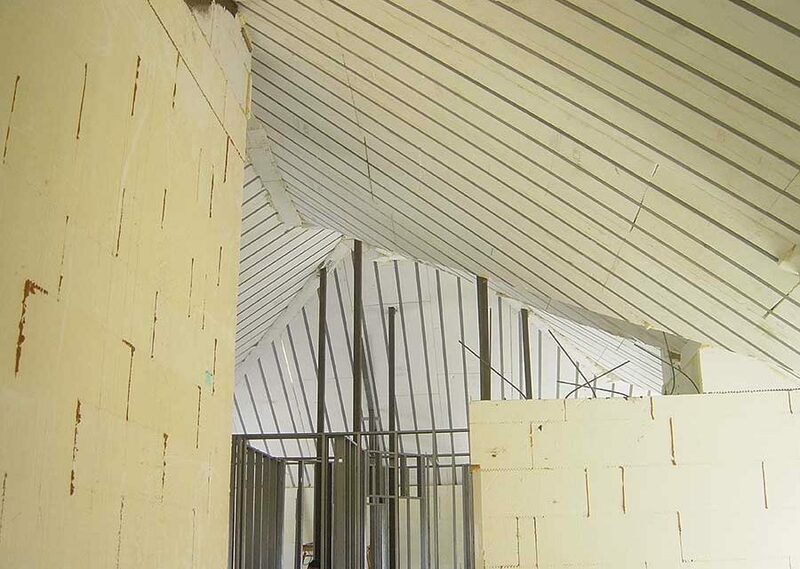 Sheet rock is attached to the integral furring strips. Sometimes, a dropped ceiling—similar to commercial construction—is installed.